With all this rain we have a Crocodile River that’s pretty wild, very cool if you want to enjoy the rapids and the gorge for Kloofing has had waterfalls pouring over just about every ledge, it’s amazing. Don’t forget about Rock climbing and Abseiling, got quite a few of those coming up and hey, those of you who need to work off the Christmas dinner and have done the Basic Rock course, book your Sport Course!! We are thrilled, we’ve got loads of trips to the Drakensberg lined up, there’s a really cool overnight Trek to Thabana Ntlenyana (The highest peak in the Drakensberg) which includes the 4x4 trip up Sani Pass AND a stop at Sani Top Chalet for a drink at South Africa’s highest pub, on the way down, it’s in a week or so time 19th/ 20th Jan, book quickly!!! KILIMANJARO! Yip end of July it is, are you fit, are you keen have you booked yet? We can’t wait to get back up to the Summit of Africa, please join us, it’s a blast! July’s trip is on the Machame Route, you just can’t beat it, well unless you want to climb Mt Kenya, check out that new page. Of course if you have another date in mind, we’ll take you then, there may be one in September too. If you’re keen on Adventure Guiding, want more info or want to work for GoVertical or in the industry, check out the new guiding page on GoVertical’s website or email us for more info. We work 365 days a year, 366 on leap years so if there are 2 of you book any adventure for any date! By yourself? Don't stress join one of the scheduled adventures below. We probably haven't made a mistake with the dates, we do run more than one adventure on a day, so if you have a date & adventure in mind just ask. A scenic hike to the top of the huge Magaliesberg cliffs, exploring the Escarpment with great views over the valley and beautiful wind sculpted rock formations, soaring vultures and elusive black eagles. After a relaxing hikers lunch we go vertical over a free fall abseil and then back through the woodland in the afternoon. A full day of Adventure, no experience necessary! An early start for this day climb of the Sentinel peak 3065m. 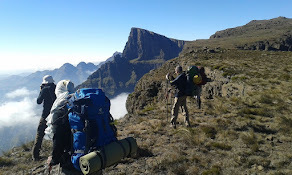 It is a technical climb of the highest freestanding peak in the Northern Drakensberg. The climb is great, not too difficult, we do recommend our Introductory Climbing course to get you into the swing of things. fit and comfortable with heights will enjoy it. We provide all the adventure gear . The views are awesome and reaching the summit is fantastic! Email us for details. Explore the Amphitheatre on the first day and the stunning Worlds View on the second, accommodation in a local mountain lodge, no heavy bags! KILIMANJARO - Machame Route - A rewarding route exploring the West of Kibo, passing Shira and then round the South to summit via Stella Point . If you want to join us, now's the time to book and now's the time to start your training! This is a beautiful scenic route, don't miss out! 10 – 18 July or any date you have in mind. MT KENYA – Chogoria route & North Face Standard Route – Sheer rock, awesome exposure, high altitude tarns, equatorial glaciers and unbelievable scenery. A great combination of high altitude trekking and rock climbing. July - or any date you have in mind. Hope to see you in the mountains soon!